Home / videos / Bypass Nokia 2 TA-1029 FRP/Google Account On Android V7.1.1 To V8.1.0 Without Pc. 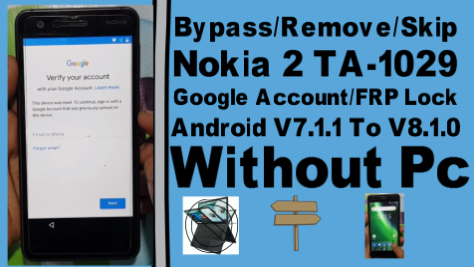 Nokia 2 Frp Lock Bypass Required File. Nokia 2 Frp Lock Bypass Method. 7# Disable talkback setting using volume up and down key. 14# Download Quick Shortcut Maker Apk. 15# Install and open setting. 19# Go to Apps info. 20# Unstall google account manager. 21# Disable google play servic. 22# Download 2018 Frp Lock Remove Apk. 25# Go to User and account. 26# Logine New gmail id. 27# Enable google play servic. 33# Now reset your phone. 35# Now your nokia phone all model frp remove complite.